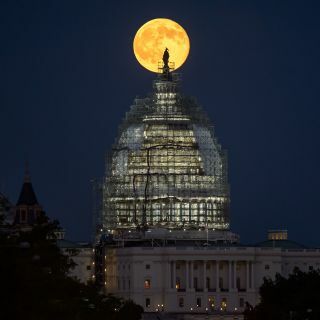 The second full moon of July 2015, a so-called Blue Moon, rises behind the dome of the U.S. Capitol in this amazing view by NASA photographer Bill Ingalls in Washington, D.C. on July 31, 2015. The second full moon of July wowed skywatchers around the world - and even in space - on Friday, offering the lunar treat of a so-called Blue Moon that won't be seen again until 2018. NASA astronaut Scott Kelly on the International Space Station posted this photo of the Blue Moon full moon of July 31, 2015 on Twitter. NASA and Space.com readers across the United States and abroad captured amazing photos of the Blue Moon on Friday (July 31), but perhaps the most remote view came from space. Friday's full moon followed just a few weeks after the first full moon of the month, on July 1, meeting. The "two full moons in a month" definition of a Blue Moon, which became popular in the 20th century, is actually one of two classifications for the lunar sight. The term originally referred to the third full moon in a season that had four full moons, a special event since most three-month seasons have just three full moons (one a month). The next Blue Moon will occur in 2018 on Jan. 31 and be promptly followed by a second Blue Moon on March 31. Both months in that year have two full moons, according to EarthSky.org. The Blue Moon full moon of July 2015 rises over the Ozarks near Ava, Missouri in this photo captured by skywatcher Debbie Wray. But definitions aside, Friday's Blue Moon full moon appeared to be an epic sight. In Washington, D.C., NASA photographer Bill Ingalls captured spectacular views of a huge full moon rising behind the dome of the U.S. Capitol. He even caught an airplane flying across the face of the moon. Photographer Shreenivasan Manievannan captures the "Blue Hour" of the Blue Moon full moon of July 31, 2015 from Table Rock Mountain in South Carolina. The Blue Moon full moon of July 2015 shines over Table Rock Mountain in South Carolina in this amazing view by photographer Shreenivasan Manievannan on July 31, 2015. Photographer Shreenivasan Manievannan in South Carolina woke up extra early to photograph the full moon on Friday (the moon actually reached its full phase at 6:43 a.m. EDT (1043 GMT)).The result: breathtaking views of the Blue Moon over Table Rock Mountain in Table Rock State Park in the Blue Ridge Mountains. "I started from home at 4 a.m. for an hour and half drive to capture the Blue Moon at its 100-percent fullness," Manievannan wrote in an email to Space.com. "As soon as I reached, the moon went behind the huge chunk of cloud, I wanted to wait it out to see if the moon will show up before it sets. And after half hour of wait, the moon decided to stop playing hide and seek with me to show itself over the Carolina mountains in all its glory"
In San Antonio, Texas, skywatcher Shenandoah Sanchez was excited to see the Blue Moon finally appear from behind clouds. The Blue Moon full moon of 2015 rises behind the Tower of America in San Antonio, Texas in this view from skywatcher by Maj Shenandoah Sanchez on July 31, 2015. "Originally, blocked by haze and clouds as it rose above the horizon, the Blue Moon revealed itself just in time to be seen moving above the Tower of the America's in San Antonio, Texas," Sanchez wrote. Some moon revelers like Elisa Barnes-Shizak, toasted the Blue Moon with a frosty beverage. Space.com also received photos from skywatchers from locales as far flung as Canada, Australia, Poland, Venezuela and Puerto Rico. Stojan Stojanovski of the Ohrid Astronomy Association in Ohrid, Macedonia captured this stunning view of the Blue Moon full moon rising over the city on July 31, 2015. In Ohrid, Macedonia, amateur astronomer Stojan Stojanovski of the Ohrid Astronomy Association captured stunning views of the bright moon shining over the sea near Ohrid. In Whitstable, England, skywatcher Rose Chapman used her phone to snap a picture of the Blue Moon and recall the memory of a family member lost during a previous Blue Moon. "This Blue Moon is sentimental to me because the last one I saw was August 20, 2013," Chapman wrote in an email. "That day was my 35th birthday, and also the day we lost my husband's granddad. This is our first visit back to England since the funeral." An airplane flies in front of the brilliant Blue Moon full moon of July 31, 2015 in this stunning photo captured by skywatcher Chris Jankowski of Erie, Pennsylvania on July 31, 2015. Chapman said that the Blue Moon clearly did not look blue to her eye, and with good reason. The "Blue Moon" moniker is just a name, with the moon usually shining as its bright white self and not actually appearing blue. In rare occasions, the moon can take on a blue hue due to ash in the atmosphere from volcanic eruptions, NASA officials have said. Editor's note:Thank you to all the Space.com readers who sent in photos of the Blue Moon on Friday. If you have a moon photo, or any other night sky view, that you'd like to share for a possible story or gallery, send images and comments in to managing editor Tariq Malik at spacephotos@space.com.